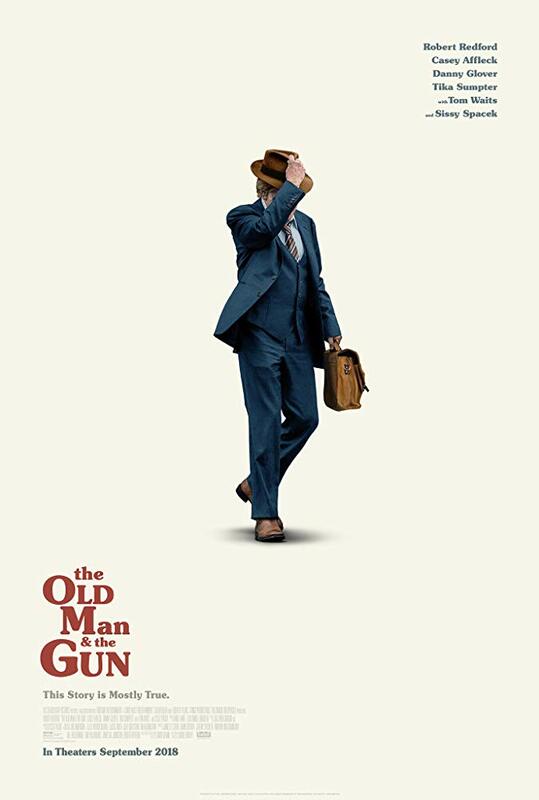 Why is “The Old Man & the Gun” rated PG-13? The MPAA rating has been assigned for “brief strong language.” The Kids-In-Mind.com evaluation includes some robberies without explicit violence, a couple of car chases, and at least 1 F-word. Read our parents’ guide below for details on sexual content, violence & strong language. – A husband and his wife hug and kiss and dance in their kitchen. A husband and his wife hug and kiss in a few scenes. A man and a woman kiss. ► A woman asks a man, “Got any kids?,” and he replies, “I hope not.” A man jokes about a drive with another man being “romantic.” A man talks about his stepfather wearing “whitey tighties.” A woman talks about having married young. ► A woman wears a low-cut tank top and short shorts that reveal bare upper chest and cleavage and a glimpse of her upper thigh. A woman wears a low-cut blouse that reveals cleavage. - A man is surrounded by police and FBI agents outside his house, he jumps into his car and speeds away as he is shot at (he is shot in the arm and we see blood on his hand later); he speeds through streets and crashes into another car, he stops another woman driving and gets into the car with her and her young son, and then drops the two off and takes the car. We hear that a bank security guard shot twice as robbers escaped after a robbery; we see a man with a bloody wound on his side as another man tends to him. ► A man with a gun in his coat speaks to a man in a bank and shows him the gun; they go to the man's office and the man fills a briefcase with money from the tellers' drawers, gives the money to the gunman and the gunman leaves the bank. ► A man in a car is chased by police, he drives through a field, skids back onto a road and is surrounded by police cars; he gets out of his car with his hands up and officers hold him at gunpoint as he makes the shape of a gun with his hand and we hear a gunshot as the scene ends (we do not see any injuries). A man in a car is chased by police through streets, he stops to change cars and speeds away, he stops to help a stranded motorist on the highway and the police cars speed past, unaware. A man is shown handcuffed to a hospital bed. ► After a robbery a bank manager locks the customers and staff in the building until the police arrive and interview everyone. We see the scene of a bank robbery with money and safe deposit boxes are strewn around a vault. ► A man puts a gun in his car glove compartment in a couple of scenes and we see the gun in the compartment in a couple of scenes. We hear police dispatch operators communicating with officers about bank robbery suspects in several scenes and during car chases. We hear a news report about a missing man. We see a man in a jail cell. We see several escapes where a young boy throws a string of sheets out a window in a reform school to climb down, a man rolls under a moving bus and clings to the bottom of the bus to escape prison, we see a man digging holes in the ground to escape prisons, we see a man carving away at cell bars to escape a prison, a man jumps off the back of a prison work truck and runs away, and a man builds himself a boat and sails away from San Quentin. ► A man and woman walk out of a jewelry store with a bracelet they have not paid for; the woman stops and they go back inside to pay for it. We see a western movie on a TV as men on horseback shoot at each other (we see no wounds). ► We hear that a man escaped prison 16 times, including from San Quentin. A man talks about climbing through a window in his house while drunk as his stepfather held a gun on him. A woman tells a man that she stole the truck she was driving (she did not). A man tells a woman that he is a bank robber and she does not believe him. A woman talks about her husband having died. A woman talks about her father being in prison and that he probably didn't know she existed. A man watches an armored car drive by and we hear that he robbed 4 banks later that day. - A police officer makes a comment about someone being "so jacked up." A man drinks from beer bottles in several scenes (at home and at a bar), a man drinks a glass of whiskey, two men in a bar drink beer and a third man has a beverage that could be alcoholic, a young boy asks his father if he can have a sip of his beer and the man says no, and a man talks about being drunk one night and having to climb through a window in his house. A woman smokes a cigarette in a house. - Bank robbery, prison, escaping prison, repeat offenders, aging, happiness, secrets, trust, changing careers, succeeding at something, petty crime, being where you are supposed to be, trying new things, FBI, doing what you love. - Some people are incapable of ever reforming themselves, even in old age and even when an activity defining their lives is illicit and dangerous.